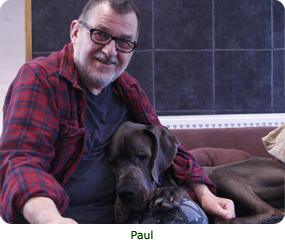 Daneline International Charitable Foundation, Great Dane Rescue - URGENT APPEAL, can you foster or adopt a Great Dane? 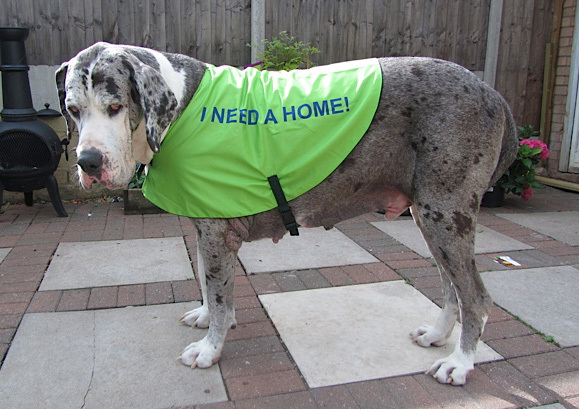 Please click here to contact Sue or Lissi if you can help us care for Great Danes who need temporary homes where they can be assessed before going to their permanent home. Expenses are paid and hopefully you will get the personal satisfaction of knowing that you have helped a Dane in need. We are in desperate need of short term foster homes for many of our Great Danes who are in need of TLC (tender loving care). Some of these dogs have lived appalling lives of neglect, others we just need to get to know so we can find the right family for them, we need foster carers to help us. All costs incurred, e.g. food, bowls, bedding, petrol for transport, veterinary expenses will be supplied / covered by Daneline. Can you spare a couple of weeks of your time to help these noble and gentle giants in their hour of need? If you can please contact us now for further information. 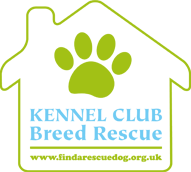 We will support you by providing professional help/training, with someone on call 24/7. Daneline use foster homes instead of kennels while finding homes for the dogs. This is much less traumatic for the dog than being caged at a rescue centre and Daneline have a network of foster homes throughout the UK. 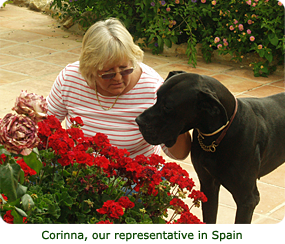 The aim of our foster homes is to make a clear and accurate assessment of the Dane in their care. As our foster carers have been trained in behavioural modification at varying levels our dogs can be retrained if necessary or helped to modify any bad behaviour whilst in a stable, knowledgeable, and loving home therefore enabling Daneline to match home and Dane more accurately. 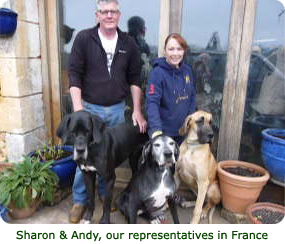 Last year we had a 98% success rate in re-homing our Danes into their new home first time around. We offer a 24 hour support telephone system to all new owners but do not guarantee to be as compos mentis in the early hours of the morning as we might be later in the day!! 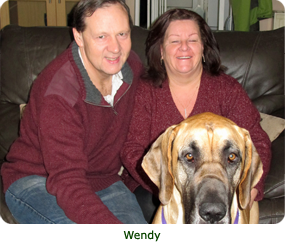 Having been involved with Daneline and the fostering of Great Danes for perhaps 3 years now, I have been asked to write a bit for the website about our experiences and why we did it. 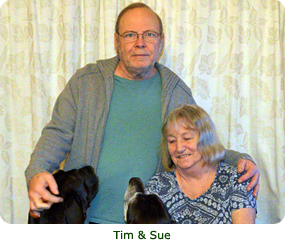 For most of our married life Deb and I had been proud owners of border collies – you know, those super intelligent dogs who spend most of their time either running like the wind or, on their backs wanting to have their tummies rubbed. Then in the 90’s we switched breeds when Taz (a brindle) and Lottie (a blue) Dane came to stay with us in our house. We were hooked and fell in love with the breed immediately. As inevitably happens, both of them eventually went to wait for us at Rainbow Bridge and, because of the depth of our love for them and the hurt we felt when they left us, we decided that going forward we no longer wanted to own any more dogs. As time moved on we did everything we could to resist the temptation to get another. We moved house and thought “that will fix it, there is no way we can have a Great Dane here.” But we were wrong. 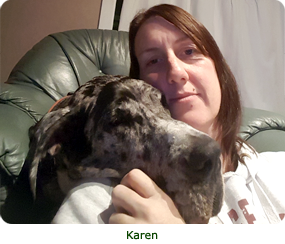 After a while we realised that we could have a Dane; but we still didn’t want to go through the range of emotions that we had experienced when Taz and Lottie had left us. And then I persuaded Deb that it would be a really good idea if I contacted Daneline and offered our services as foster carers for these lovely dogs that are put up for adoption. We were warned that it might not be easy and soon found out that this could well be the case but, we quickly worked out who was best at what, in order to help the more challenging of our charges get ready to move on to their new forever homes. It soon became apparent that for all matters outside the house I would, (quite literally), take the lead. I became responsible for getting those that had a bit of a naughty streak to walk nicely on the lead, to be sociable with two and four legged things that we encountered, to learn how to run around and play nicely and hopefully, to come back when called! But the real star of the set up was Deb. It seemed like she was there 24 hours a day for them caring for them and although we were a partnership it was she that really loved and looked after them. Besides feeding, bathing and cuddles, if they had any medical problems she would be on top of the game and would make sure that any lotions, potions and/or tablets were duly administered, and always with the greatest love and care. Each and every one of the Danes that we fostered responded really well to her care. And as each and every one of them regularly insisted on sitting on her (obviously just so that they could be close to her), it was clear that they returned that love with all their big soft hearts. “Deb, as most of you knew, loved and cared for her people, and she would protect her people, fiercely if required. “Being part of her family meant that you got a free pass into a special club. Her people included all those she knew, liked and loved. But you didn't have to be human to be loved by her, in fact in some respects it helped if you weren't. “Mum had a passion for animals and would often have to be told that she wasn't allowed to have an alpaca, orang-utan or chinchilla. But the ones she loved above all other animals, were her Danes. She was rarely at the top of the pecking order but, Dappy the mummy's boy and all the girls knew that she was there, to look after them and make their difficult starts in life, all better. “She never thought that she had masses of human friends, she much preferred to have those around her whose company she genuinely enjoyed and if you shared a laugh with her, and you happened to see that sparkle in her eye, which gave away her warm heart, then understand this, you were lucky. And now my darling Deb has gone. She has gone to see Taz and Lottie and all our old faithful collies who have been waiting for her at Rainbow Bridge. I just hope that she is waiting there for me, so we can be together once more with all our lovely dogs. And in the meantime, I will do what I can to help Daneline but please, if you think you can help with fostering, please do get in touch with Lissi or Sue because, although I have lost the love of my life, they have just lost a real gem of a foster carer. I guess if you are reading this that you interested in one of two things: either you are thinking about fostering, or you are interested in adopting. If you are a would-be foster carer, I hope that I am about to give you an insight into what it is all about and what we, as fosterers, do, and if you are a potential adopter with luck it will answer some of your questions and you will have some understanding why we can say to you with a fair degree of certainty that Fred located in West Yorkshire is the right dog for you. I am a foster carer. I had long chats with both Sue and Lissi about fostering and then we were home checked before being accepted as a foster home. This was back in March 2005. Things moved rapidly from there and the first foster was here. Believe me, the first is the worst: not only do you not know what will come through the door, but you don’t have your own rules, routines and tests worked out and honed. So what is it all about? Well, the first thing I should say is that you need time, and someone really needs to be at home all day. You can never be 100% certain what you will get, and in fairness neither Sue nor Lissi can make guarantees at that stage either. The dog which walks through the door may turn out to be very different in temperament and personality to that described by the soon-to-be-ex-owner. If it turns out to suffer from, say, separation anxiety, the last thing you need is to return to find your house destroyed. 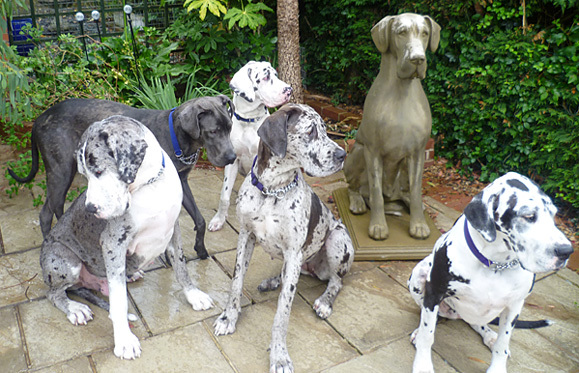 Every foster Dane is different and every one is assessed in a foster home before going to the new home. Some are no trouble at all; they behave as if they have always lived with the carer from the minute they arrive and they don’t look back as they are driven away. Others cause chaos when they arrive and the world is far quieter after they have left. Some are chewers; one of our Persian rugs has a corner missing as a result. Some have always lived in a kennel and know nothing of life in a house never mind being house trained. Some are bold, brash and forward while others are nervous to the point of being fear biters. Some play, play, play, while others plod alongside. Some have been trained, most haven’t. Some will attack anything which moves; others are the gentlest souls you could meet. Some like all people, others are selective. Some arrive thin and need to be fed up; others are podgy and need to be put on a diet. Some are so traumatised for one reason or another that they take days before they start to bond with the foster home. Each dog’s needs are individual; each dog needs different care. The dogs’ circumstances are all different, too. They are not all victims of cruelty or abuse. 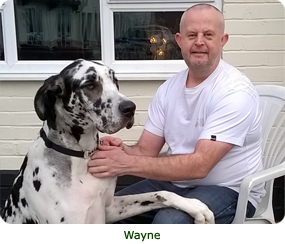 Divorce, financial difficulties, serious illness or even death of the owner, change of job, or even the fact that the Dane didn’t get on with another pet in the household can all result in the dog coming into Rescue. 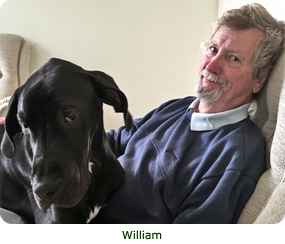 Then there are the owners who didn’t realise for some reason that the little furball of a Great Dane puppy really would grow into a very large dog or were ill-equipped or unable to train and handle that hooligan of a harlequin pup! As far as assessment goes, you could ask several foster carers and all will describe different things they have done, but the end result is always the same: Daneline has a very good idea of the dogs’ personalities and temperaments. This is my personal account; others’ practices will vary. Usually the day after the dog arrives we go down to the vet to be weighed and health checked. If I as a foster carer have any concerns over the dog’s health I will already have discussed the issues with Sue or Lissi and agreed a course of action. If a dog needs veterinary treatment, it gets it, and unless it is very serious and we all feel the dog would be better elsewhere it is my job to see that it happens. Along with the weigh-in, our visit to the vet also reveals what the dog is like along a busy road as the vet’s is situated on one of the roads up to the motorway and there is usually a variety of traffic thundering along. The pavement is narrow and the dog has to pass people of all ages and potentially scary objects like prams, pushchairs and dustbins. If a dog is more nervous, we will have been out along the local lanes and quieter roads before venturing down to the village, to build up confidence. At first the dog is always walked on the lead but there comes a point where it has to be tried off-lead. That can be a nerve wracking moment: will the dog come back? The dog’s recall is then graded - Good, Bad or Goodbye. If it is possible they will first be let off lead when it is pouring with rain - not many Danes enjoy this weather and, with the rain coming in horizontally more often than not up here, there is a good chance the foster will run home! If it doesn’t ... then I could be in the field for a while! The dogs also go to see the local livestock. Our neighbours have horses and an old cat called Gizmo who is now used to this testing lark and just sits there looking at the dogs. There are nearly always sheep in the fields around us and occasionally some cattle, so we look at those from over the fence. Our neighbours also have a couple of labradors, one of which is only little but she can open the door of the house and let herself out, then get into our garden, down to the house, and open our door and let herself in. This unannounced and enthusiastic visit is usually a surprise to all of us and a good test of the new dog. Our next major trip out is usually to Pets at Home or similar as we need to find children. There is always some child willing to pat, poke or prod a big dog when you aren’t looking, and this is as good a place as any to find one (or more). All “my” fosters go their new home with a new half-check collar and matching lead so we get them while we are in the store, plus the store sells furries which we go and terrorise, birds (likewise) and fish (we just look at those). So far we have managed to avoid any of the fosters actually catching any of the furries - these are kept inside an enclosure with a picket fence which is only knee-high to a Great Dane. I always let Sue or Lissi know when the foster has arrived and then try to do the initial assessment as soon as possible and let them know what we have found so far. This lets them start to think about a suitable home. In the meantime the foster is involved in all the normal things we do with our dogs - walks, feeding and outings - and if it has any particular problems we start to work on them. The foster dog is loved and cared for as if it were our own. Sometimes work (and it can be a lot of it) is needed to teach some manners or modify a behaviour, and that work is ongoing until the point at which the dog leaves as a (hopefully) pleasant member of canine society. By the time the dog is ready to go there is not much we don’t know about its behaviour and manners, although they can always surprise us. At some point we get “the call” - a home has been found. There will then be much swapping of phone numbers and a long chat with an (often) excited adopter. I have learnt to leave at least an hour for chatting about Dane generalities and then about the specific dog. During that time the would-be adopter learns about the dog’s good and bad points, habits, personality and foibles. If someone is on email I send some photos. If the adopter is not put off, and few are because care has been taken with the match, we arrange for the adopter, usually with but sometimes without family, to come and see the dog. People often ask me how I can bear to part with the foster dog. The answer is simple - I don’t have a problem with it because I can’t keep them all. The adopters have been thoroughly checked out before they get to this stage, too, and the vast majority of them are so excited about the whole thing and can’t wait. My job is done; it’s time for the current dog to move on and make way for the next. When they do come the adopters are given as much time as they need with the dog, and to ask as many questions as they like. Sometimes it is only half an hour or so, while other times it can be two or three hours - it takes as long as it takes. Sometimes the adopter brings an existing dog and we all want to ensure that both dogs will get on together, especially when they have to travel back in the same vehicle! If I don’t think a home is right for my foster dog, I can tell that to the adopter and send them home without the dog. Formalities complete, the foster is packed off home with new collar and lead, any bits and pieces it came in with, and enough tripe and biscuit to keep it going for a few days. Many of “my” adopters have kept in touch, and I enjoy receiving emails, letters and photos letting me know how the dogs are getting on. I had better also mention the paperwork. There is a form for everything - foster carer, surrendering owner and adopter all have to sign their lives away, plus there are forms to complete about the dog itself. The easy way to handle this is as you go along!! Adopters are also sent away with a pack of information which has to be prepared in advance, and I give them some notes on how their new dog has been in our home and what I know of its background. All the paperwork goes back to Sue. I also take photos for Sue and Lissi, so they can see for themselves what the dog looks like. 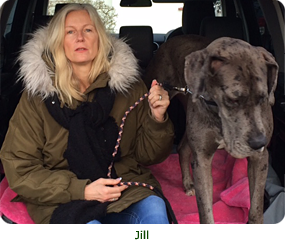 In nearly 40 years Sue and Lissi and their team of volunteers throughout the country have rescued thousands of Danes. Our promise is to respond as soon as possible, whatever the weather and whatever the distance. We believe that the welfare of the dog is paramount. Most of our rescues appear as pure bred Great Danes but the following account concerns the recovery of a family of six Dane-crosses. 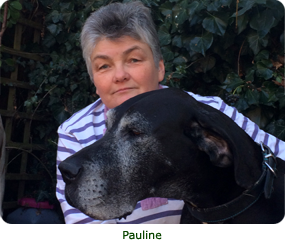 My name is Christine McMahon, I was the co founder of GDAS with Joy Leddingham back in 2000 but I now choose to foster Great Danes for Daneline. I was contacted by Lissi from Daneline one evening some time ago after she received an urgent call from an employee of a council run country park near Bromley. 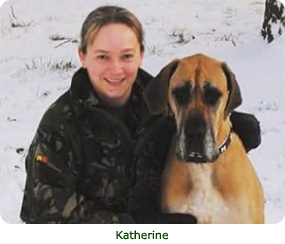 They had phoned several Great Dane rescue organisations who had not responded and they were getting desperate. Lissi called me to see if I could help as I only live 60 miles from the Bromley area. Lissi was told that there had been several reports of dogs straying on the country park land. The employees had managed to round them up and they were within the yard outside the offices but there was no shelter and they were worried about leaving the dogs outside overnight. I rang the lady at the country park estate office who confirmed that there were 6 dogs, one believed to be the father and that they were Dane crosses. I began my drive up to Bromley within an hour (knowing they were Dane Crosses) and we happily took all 6 dogs. 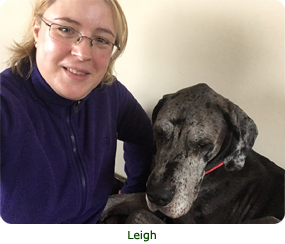 Even though Daneline re-homes Great Danes and has a waiting list of Danes seeking a new homes for Great Danes, Lissi would never leave ANY DOG in distress and outside overnight; so we agreed to help and this became “just another rescue” and as urgent as every one. I contacted my friend of many years, Billy from WADARS (Worthing and District Animal Rescue Society) and explained the situation and he was happy to take the dogs, as I do not personally have room to foster 6 dogs OF ANY BREED! I drove the 6 dogs from Bromley to Grove Lodge’s all night Veterinary Surgery and we safely tucked them up in a family kennel with plenty of food and warm clean bedding. The next day the dogs were vaccinated, health checked and moved to WADARS kennels near Worthing. I since have been to visit Dad and the pups – of which there are only Dad and 2 puppies left to re-home now – one being placed in a permanent home today! I shall be taking Dad in to my home in January to house train him in order to make his placement into a permanent home a smoother transition. Daneline would like to thank Billy from WADARS and the staff of the country park. Without their prompt action it is almost certain that this rescue would have had a sad outcome. Our special thanks to all of the volunteers, drivers and foster parents who work with Daneline. Here are our new tabard Dane coats. We are hoping that the coats will help to enlighten the public of the plight of some of our dogs and maybe help with fundraising and rehoming - fingers crossed. We would like to thank Michelle from Boomerjacks Collars and Leads for making the coats for free, and to V.M.R. Printers in Bristol who very kindly printed them, also for free. I am the bridge between what was and what can be. I am the pathway to a new life. For one little time you are mine. I will feed you with my own hand, I will love you with my whole heart, I will make you whole. I am made of steel, because when the time comes, when you are well, and sleek, when your eyes shine, and your tail wags with joy then comes the hard part. I will let you go - not without a tear, but without a regret. For you are safe forever - a new dog needs me now. 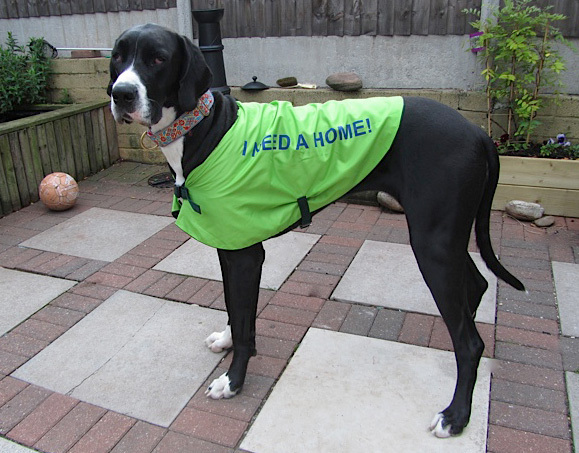 Are you an experienced dog owner who feels able to adopt any of our Great Danes? We can now accept donations via PayPal. Who are Daneline International Charitable Foundation? Meet the Team here! Buy Great Dane fridge magnets or make a donation to help raise funds for Daneline! Here is our core team of foster parents. Thank you all! If you would like to link to us, please grab our link JPEG below. It can safely be sized down (smaller). Thank you! © Daneline International Charitable Foundation. Lissi de Figueiredo, 7 Hampstead Road, Brislington, Bristol BS4 3HL. Tel: 0117 972 3343. Suzanne Satterley, The Annexe, Court Garden, Thurlbear, Taunton, Somerset TA3 5BW. Tel: 01823 330 591. Trustees: Lissi de Figueiredo, Suzanne Satterley, Susan Garnett, Matthew Cripps, Cerise Reed. Veterinary Advisor: Robert Dawson BVMS, Highcroft Vets. Web design by Aardvark Creative.